If you want to extend the hours for outdoor enjoyment on your property, consider the benefits of landscape lights around the exterior of your home. Landscape lighting brings a beautiful night time glow to your yard and garden, plus gives you the peace of mind from the additional security of lighted walkways and service areas around your home. Today's integrated lighting solutions are designed to create a lighting portrait by highlighting sculptures, up lighting trees or providing extra light around doors, gates and garages for additional security. Contemporary outdoor lighting systems are a smart investment. Professionally installed and maintained outdoor lighting systems will increase the value and resale of residential and commercial properties while simultaneously making it the showcase of the area. Properly installed low voltage lighting casts a beautiful glow while remaining extremely economical and safe to operate especially when compared to their line voltage system counterparts. Architectural lighting systems are both practical and elegant. Homeowners can enjoy more hours outside in the comfort of their own homes while creating an elegant atmosphere for entertaining. Industrial specification grade lighting systems are expandable so they can be adapted as properties are expanded and/or owners' needs change. 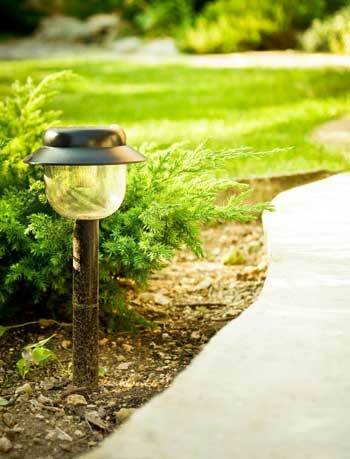 In addition to their beauty, outdoor lighting fixtures offer increased lighting for safety and security. An outdoor lighting system is the cure for any building or area masked in darkness. Contact your local electrician or landscape lighting specialist for professional installation of the highest quality products that produce even lighting output at every fixture for a nearly maintenance free outdoor lighting application. Also, see our directory of landscaping contractors for help with your next landscaping project.